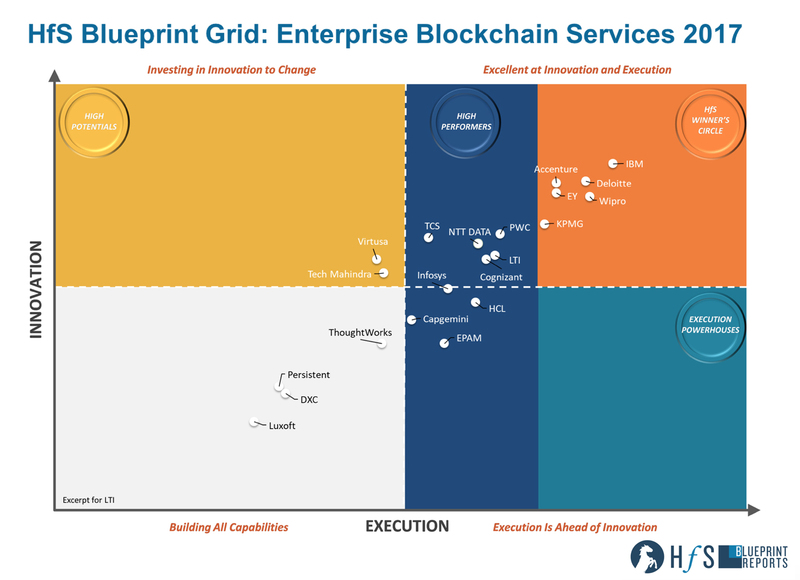 November 24, 2017: LTI is featured as a “High Performer” in the HfS Blueprint Report 2017, for its expertise in the enterprise blockchain ecosystem. Assessment was based on the evaluation of 21 service providers of enterprise blockchain services, across 2 main categories – Innovation & Execution. LTI’s mention was primarily attributed to the organization’s robust blockchain services capabilities, in addition to its in-house solution accelerators, and a focused start-up approach. The organization was also featured among the top players as a service provider with the maximum depth of adoption across its use cases. Combined with the innovative offerings brought about by exponential technologies under its Mosaic brand, LTI’s blockchain practice is rapidly gaining momentum in building its capabilities to cater to the enterprises of the Digital age. Moreover, the organization’s growing partnership with India-based Industry Consortia and start-ups, as part of its drive to strengthen its market development efforts in India, has given it an added edge among the other prominent players in this space. Through business innovation centers located across its global client locations, LTI’s start-up approach to innovation has led the organization to co-create offerings with 350+ start-ups, and also partner with world-renowned academia like MIT-CISR and IIT Bombay. LTI’s standing is testimony to the organization’s strengthening position in the enterprise blockchain space. With 50+ identified use cases and 15+ ready-to-deploy blockchain solutions, LTI is well on its way toward becoming a key player in effectively leveraging blockchain technology to build the enterprises of tomorrow.